A series of CCTV images have been issued of suspects being hunted after protests turned violent in Bristol. Police made 30 arrests following the clashes in the Stokes Croft area in the early hours of Friday. 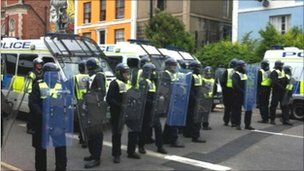 Officers and protesters were injured during a second demonstration in a week against the opening of a Tesco store in the area. 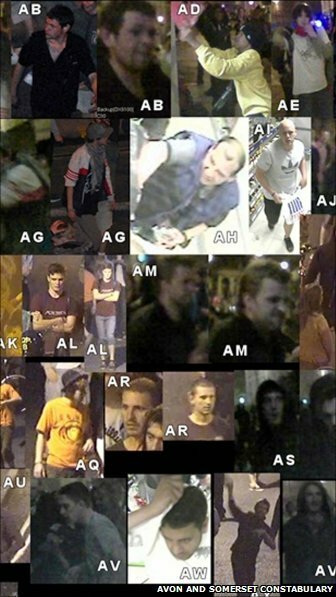 Images of more than 80 people have been issued by Avon and Somerset Police following the violence. Rocks, bottles and other missiles were thrown during the protests, which had started peacefully in Cheltenham Road, at about 2000 BST on Thursday. Police said they were determined to identify as many people involved as possible and bring them to justice. Assistant Chief Constable Rod Hansen said “we cannot do it all alone”. “So I am appealing to the community, to all the residents, and traders and other people whose lives have been severely disrupted, whose property may have been damaged and whose personal safety may have been put at risk by the violence: help us bring those responsible to justice. The road was closed while the raid took place, before being re-opened. A week ago, the Tesco Express store in the street was damaged during an earlier protest after another raid on a squat. Police said last week’s operation was carried out because they feared the newly-opened branch was to be petrol bombed. Thursday night’s demonstration began as a “good-spirited event” attended by about eight neighbourhood beat officers determined to keep things peaceful, police said, . “But the crowd grew, from around 250 or so protesters earlier in the evening to more than 400,” a spokesman said. He said he was “flabbergasted” about the way officers had conducted themselves. Chris D’Agorne, who lives in Bristol and works for the BBC, said: “I got trapped between the police and the protesters who were throwing bins, glass bottles and bricks. A Tesco spokesperson said: “It’s very sad that a handful of individuals have once again turned against police and the local community.